In April, 1970, the Secretary of the Interior determined that the Waterford Historic District possessed national significance and he designated the Waterford Historic District a National Historic Landmark. This is the highest designation of historic significance possible in the United States of America. The criteria for such a designation is expressed thusly: "National significance is ascribed to districts, sites, buildings, structures and objects that possess exceptional value or quality in illustrating or interpreting the heritage of the United States in history, architecture, archeology, engineering and culture, and that possess a high degree of integrity of location, design, setting, materials, workmanship, feeling and association. This places the Waterford Historic District on the same level of significance as Independence Hall, Mount Vernon and the Alamo. 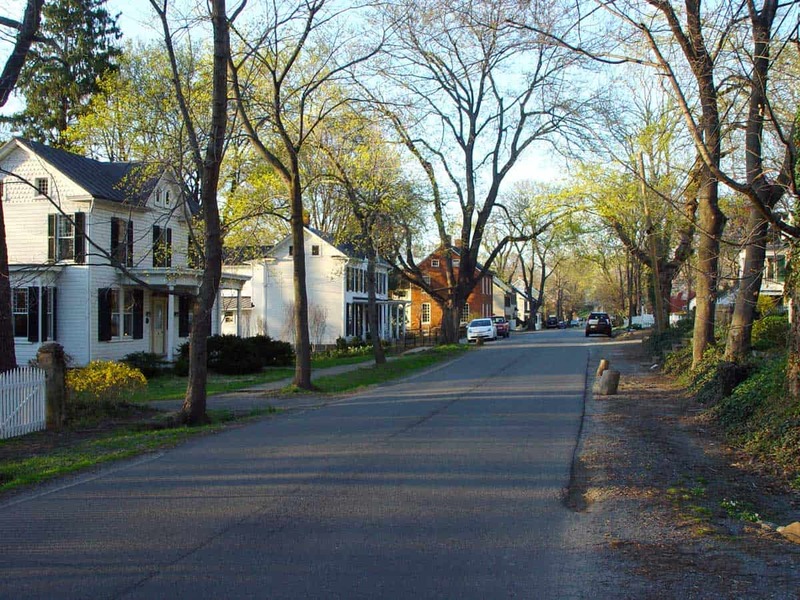 View down Second Street in Waterford. 94% of the houses were built before 1900. Why? 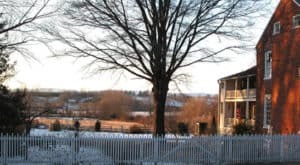 The Waterford Historic District was determined by the Secretary of the Interior and his Advisory Board to possess an extraordinary balance between the buildings and structures of the village and the absolutely unspoiled agricultural setting that surround the village. This unspoiled agricultural setting, indeed, constituted, historically, the very economic life-blood of the village. 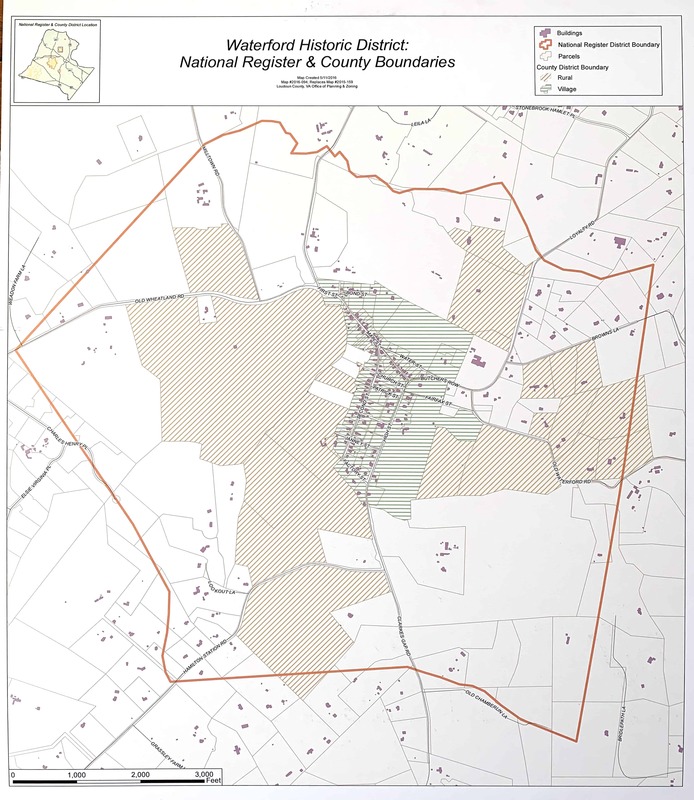 It is this balance between buildings and open space that sets Waterford apart from other rural communities whose edges have been compromised. It is this balance that gives Waterford its national significance. 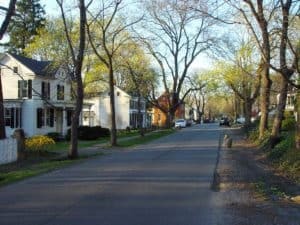 Prior to 1970 the Waterford Historic District had been listed already in the Virginia Landmarks Register and the National Register of Historic Places.
" Since war begins in the minds of men, it is in the minds of men that the defenses of peace must be constructed." The document goes on to establish that the preservation of the cultural heritage of mankind constitutes one of those "defenses of peace." Ten years prior to the establishment of UNESCO, the United States Congress passed the Historic Sites Act of 1935. This act declared [for the first time in our legislative history] that preserving the American cultural heritage was a matter of National Policy. It is in this same act that the Secretary of the Interior was given the authority to survey and evaluate our heritage and to designate particular sites and buildings as possessing "exceptional value as commemorating or illustrating the history of the United States." This activity of designating certain properties as possessing significance to the nation as a whole, marks the beginning of what we now call the National Historic Landmarks program. In 1966, preservation as a national policy was further enunciated by Congress in the National Historic Preservation Act of 1966. This act expanded our national list of historic properties beyond only those determined to possess national significance. 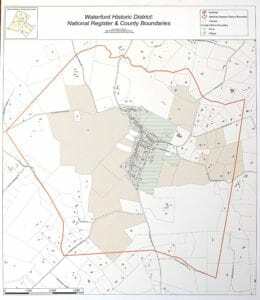 The newly expanded National Register of Historic Places now included sites of state and local significance as well. On March 4th, 2003, the President issued an new Executive Order titled Preserve America, once again demonstrating our national commitment to preserve the cultural heritage of the United States.